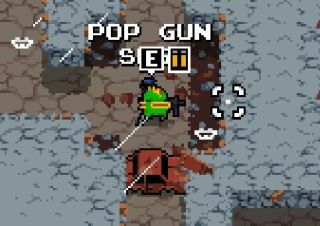 We quite liked Nuclear Throne, the post-apocalyptic top-down shooter from the guys who gave us Luftrausers and Super Crate Box, when we reviewed the Early Access version back in January. Over the weekend, and with approximately zero fanfare, it left Early Access and is now in full and official release. "As we promised, the game will launch at a pricepoint of $11,99 without any discount or sales, continuing our stance of not discounting the game during Early Access," Vlambeer's Rami Ismail wrote. "We also want to emphasize that this release doesn't mean that no more updates will happen. It's a formality we had to get out of the way, and we're aware of the issues and problems on PC. We're working to fix those." Coinciding with Nuclear Throne's official release, Vlambeer also put out "update 96," which makes a number of fixes, a couple of balance changes, and adds trading cards, emotes, and other such bits of Steamy goodness. Ismail said the newest build of the game should fix most "major bugs" but added that it was "uploaded from the PSX showfloor" in order to get it out as soon as possible, and thus wasn't tested as extensively as it normally would have been. With that in mind, he asked that any "oddities" be reported on the Steam forums.